This past Sunday night (May 29th), we at the Cool Springs Primitive Baptist Church of Danville, GA were blessed to enter into an ordination service. Brothers Tracy Bryant and Caleb Howell had previously been set aside by the church to be ordained to the office of deacon, and we were thankful to have so many of our brothers and sisters in Christ come and worship with us and participate in this service. We were also truly thankful to have 11 of our yokefellows in the ministry come and participate with us in the formation of a presbytery for the service. After a song service and introductory prayer for the service by Elder Charles Garrett, the presbytery was organized and proceeded to go forth in the business of ordination as follows. Elder Philip Conley was elected as moderator of the presbytery, and Elder Frank King was elected as clerk. Elder Franklin Bryant was elected to question the church, and Elder Tommy Sarber was elected to question Brothers Tracy and Caleb. Elder Dan Bryant was elected to offer the ordination prayer, and Elders Garry Hall and Philip Conley were elected to preach the charge. 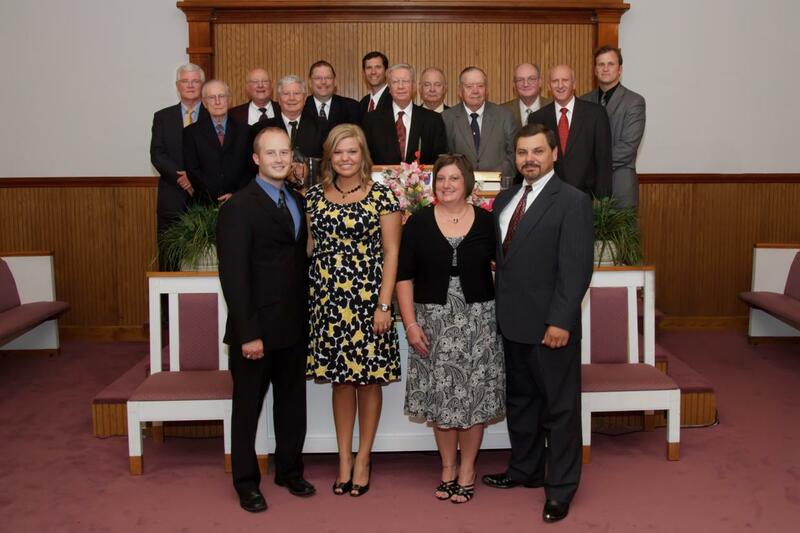 Brother Mark Moore served as the spokesman for the church. After delivering the subjects to the presbytery, Brother Mark answered Brother Franklin's questions on behalf of the church regarding the qualifications of the two men. Upon satisfactory answers to the questions, the two brethren were then examined by Brother Tommy as to their beliefs in the foundation tenets of the church of doctrine and practice. Upon satisfactory answers to the questions, the presbytery then gathered around Brothers Tracy and Caleb as Brother Dan offered a fervent and humble prayer, beseeching God's Divine watchcare over them during their service to the Lord's church. Brother Mark then delivered Sisters Elaine Bryant and Amanda Howell to be seated next to their husbands for the delivering of the charge. Brothers Garry and Philip exhorted the two men to remain steadfast, exercise wisdom, nurture boldness when needed, and exude charity in their dealings in the church, with both ministers using Stephen as a primary example. The business of the ordination then being satisfactorily completed, the presbytery turned the two men back over to the church as duly ordained deacons and the right hand of fellowship was offered by all for the brethren and their wives. Services were concluded with Elder Rabon Lord offering a prayer of benediction and thanks. Many in attendance remarked about the wonderful spirit of the service, and a dear grandmother in Israel even declared, "He was here! Oh how sweet the feeling!" Even though Jesus' presence is enough to fill the house, our sister churches confirmed their love to us by their presence and wonderful fellowship. Some estimated the congregation size to be approximately 300. Please rejoice with us that the glorious Lord has blessed us as a church body with men like Brothers Tracy and Caleb that have already shown themselves servants to the church. Pray for them that the Lord would bless them with many profitable and fruitful years of service in this office. In so doing, the Lord's people will be blessed by their efforts, as we have already been touched by their love, zeal, and devotion for the cause of Christ.